Handwritten lyrics written in pen on lined paper by Michael, apparently written in 1993 to a song that was never recorded. 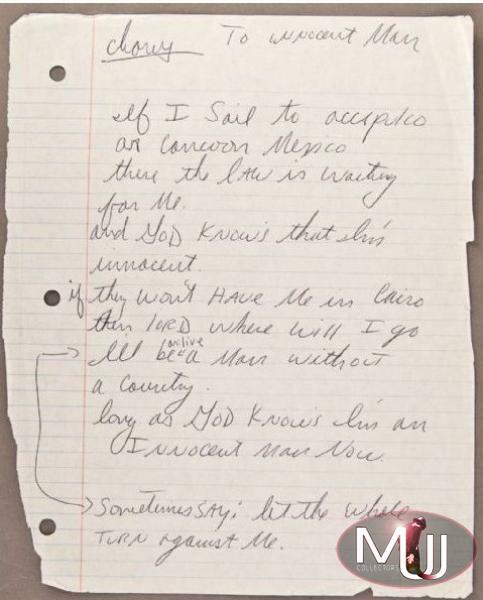 Excerpts read: "If I sailed to Acapulco or Cancun Mexico, there the law is waiting for me...God know's that I am innocent...The whole world has turned against me." Sold by Gotta Have It (Lot #17) for $4,153.20 at their 3/11/10 Rock & Roll Pop Culture Auction. All screen captures are the property of their respective owners.